When we think of tortillas, flat, round circles made of flour or corn usually come to mind. That is a Mexican tortilla. Spansh style tortillas are a different animal. They are often made with eggs and potatoes, adding different meats and vegetables to it. This version takes a traditional Spanish-style tortilla and makes it healthier while keeping it delicious. This recipe is also in keeping with the ‘slow-carb’ diet that my fiance and I are currently adhering to in advance of our wedding. 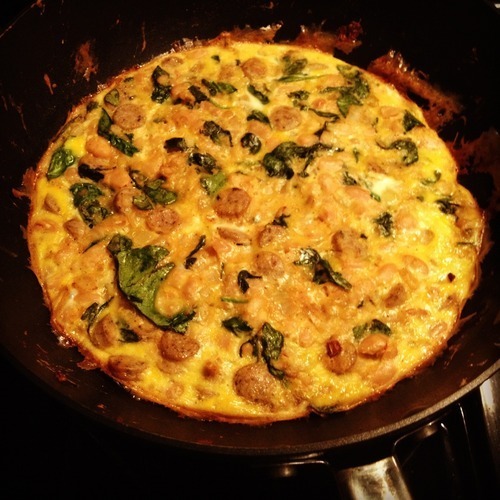 Heat large, oven-safe omelette pan to medium heat w/ knob of butter. Toss chopped onion into pan w/ some chili powder if not using chorizo sausage. If using raw sausage, toss in at same time. If using pre-cooked breakfast meat, let the onions cook alone a few minutes. Once meat has heated, add spinach and beans. Lightly stir mixture. Whisk up eggs and pour over mixture. Stir lightly to mix in eggs. Allow mixture to sit and cook for approx. 5-8 min. Place pan into oven and let bake for 20-30 min. Depending on how active you are, this will yield 2-4 servings. I make this on Sunday night and then re-heat slices throughout the week. A great and filling breakfast that provides plenty of energy to start your day.